Premier Houseboats are pleased to present a rare opportunity to own and convert a lightship, that worked of the coast of Ireland when in service , and is ready to create an amazing character home. This Lightship has everything, from a HELIPAD ideal as a sundeck (unless you own your own helicopter ) to a lantern with enough room to comfortably convert to a lounge with stunning views across the river and surrounding urban and countryside areas. There is a huge amount of available space inside, all currently fitted out with original crews furnishings. These spaces include eight beds in eight separate cabins, two toilets, two bathrooms, galley and dining area, massive chain room to convert, large generator room currently housing four working generators, a wheelhouse, winch room, and three large storage rooms. There has been a lot of steel already cut out so Gannet really is ready for a fit out. There is also a covered back deck area, and a for'd deck. This boat is immense, the potential for internal living space is amazing, and the external area has plenty of opportunity to enjoy the stunning surroundings and views. 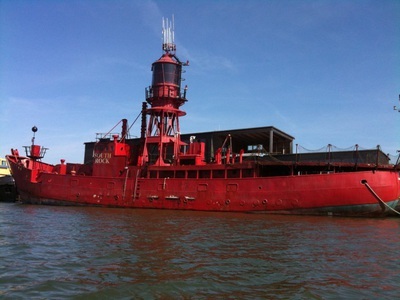 This is an amazing opportunity to own this wonderful lightship on a secure residential mooring, these are very rare, and must be seen to be appreciated. Vessel name: Gannet Vessel condition: Good Vessel type: Lightship Year constructed: 1954 Berths: 8 Heads: 2 Length over all: 137' 1" Beam: 27' Maximum draft: 10' 8" Hull material: Steel Hull type: Displacement Displacement: 600 metric tons Disclaimer Premier Houseboats offers the details of this advert in good faith as it was presented by the seller or his representative but cannot guarantee or warrant the accuracy of this information nor warrant the condition of the described item within this advert. A buyer should instruct his agents, or his surveyors, to investigate such details as the buyer desires validated. The Item described within this advert is offered subject to prior sale, price change, or withdrawal without notice.